Net Weight: Packet (20 seeds)1/2oz (125 seeds) (+$11)1oz (250 seeds)(+$19)1/4lb (1000 seeds)(+$69)1/2lb (2000 seeds) (+$112)1lb (4000 seeds) (+$158) This item is currently out of stock! An ideally shaped early prolific straightneck type with all the advantages of an F1 Hybrid; earliness, uniformity, and heavy production. 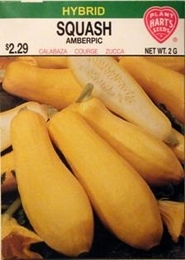 The fruit is butter yellow, smooth-skinned at best eating stage, and will continue to produce over a long period on a compact yet open plant. Fruit are best when picked small, 6-8 inches is best. Keep fruit picked to stimulate better production.